We’ve been looking at wedding venues so we can nail down the date of the big day (and waiting on word of its suitability from the astrologer), but we’ve also been planning on our engagement party. It will be May 13, in downtown Los Angeles (naturally), and it will be a blast. Invitations should be going out soon-ish. If you suspect that we don’t have your snail mail address, you should send us an email. Author JimPosted on April 14, 2006 Categories Uncategorized1 Comment on Save this other date! You’ll probably want to mark it on your calendar in pencil, but we’ve settled on a tentative date of January 13, 2007 for our wedding. This may change depending on what venue we choose and its availability, or any number of other factors. You can keep track of the months and days to go with the handy countdown clock in the sidebar. Author JimPosted on April 6, 2006 Categories Uncategorized1 Comment on Save the date! We’ll soon start updating with more about date selection, venue selection, and all of that fun stuff. Author JimPosted on April 5, 2006 Categories Uncategorized3 Comments on Thanks! 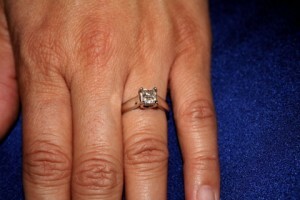 The ring is a one carat, princess cut diamond in a platinum setting – and I love it. No, we haven’t set a date yet. Yes, I do like chocolate. Very much. No, this isn’t an April Fool’s joke. Author JimPosted on April 1, 2006 January 2, 2016 Categories Uncategorized11 Comments on We are engaged.